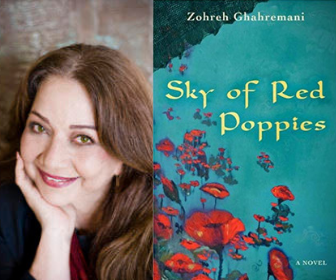 An immigrant, Zohreh draws heavily from her Iranian-American culture in her writing. Her work has won several prestigious awards, including first place in California Stories (2005), San Diego Book Awards (2004), and Best Fiction at Santa Barbara Writers Conference (2004). Hundreds of her articles and short stories have appeared in US and foreign publications, and she is a columnist for ZAN magazine. SKY OF RED POPPIES is on the reading list of many high schools and colleges, and the author holds numerous speaking engagements weekly for groups that have included the American Association of University Women, the Brandeis Society, Rotary Club, and The International Women’s Society, to name a few. She has also spoken at universities nationwide, including Georgetown University, UC Berkeley, the University of Chicago, San Francisco State University, San Diego State University and UCSD. She has been featured on Voice of America, KPBS, and more. In addition to speaking about her books, Ghahremani is a motivational speaker on how to pursue your dreams, capturing audiences’ attention with the unique experiences that helped her reach a seemingly impossible goal. My parents picked the name Zohreh for their seventh child and, with love and respect to their memory, I honored that for the first half of this life. On the second half, friends simplified my name to Zoe. While Zohreh is the Persian name of the brightest and longest lasting star of the night – Venus – Zoe in Greek simply means life. Had I been given a choice at birth, I think I would have favored my new name. Not only is it short, uncomplicated, and easy to remember, I think overall it suits me best. Indeed, while stardom is the furthest from me, life is what I am all about. The daughter of a tribal man from Khorasan, Rafi Khan Khazai, I became a Ghahremani when I married my husband of thirty years, Gary – whose name is also an abbreviation of his given name, Ghahreman. We have three children, our first born Lilly, our artist Susie, and our musician Cyrus. They alone make life interesting and definitely worth living. It no longer matters if people call me Doctor G. or Dr. K. or doctor anything. I am simply Zoe: a writer, an artist, a gardener. No matter how short life may be, I intend to discover its width and celebrate all it has to offer.